139 Alexander Street, Vancouver — Mark + Co.
ARE YOU LOOKING FOR A ONE-OF-A-KIND HOME IN THE HEART OF THE CITY? This urban walk-up is reminiscent of London, New York and San Francisco. ‘Alexander Row’ is a collection of six Paul Merrick designed city homes, unique in location, design & layout – no two homes are the same. Features include breathtaking city, mountain, water & park views; open concept living; two master bedroom suites each with ensuite bathrooms; hardwood & marble throughout; in-floor radiant heat; expansive windows on the North & South walls for bright yet airy living; a soundproof basement for an incredible media room or live-work studio; private garage with direct suite access; and, a wonderful PRIVATE ROOFTOP DECK in addition to 3 balconies. The acoustics and sense of quiet in this incredible suite will amaze. Premium location on this quiet historic street just steps to Crab Park, the water and the heart of Gastown. This is not an ordinary townhome and must be seen in person to be appreciated. See it, love it, live it! Conveniently located with restaurants, groceries, recreation, entertainment & public transit within blocks of your doorstep - the best of City living! This is a fabulous opportunity! Storage: Lots of in-suite storage available. Outdoor Area: Rooftop deck with 360 views. View: City, mountain and water. Ideal opportunity for artists or urban professionals. Secure, street level access; 250 to 1,000 square feet at/or below grade as your needs dictate. Have you ever seen a townhome with a basement? Set up your photography studio, media lab or bring your drum kit! Also makes a fabulous rec room for children or teenagers. Convert the open-concept flex rooms to bedrooms; great for families with kids seeking a City lifestyle. Option for a private two-car garage. This is not an ordinary townhome and must be seen in person to be appreciated! 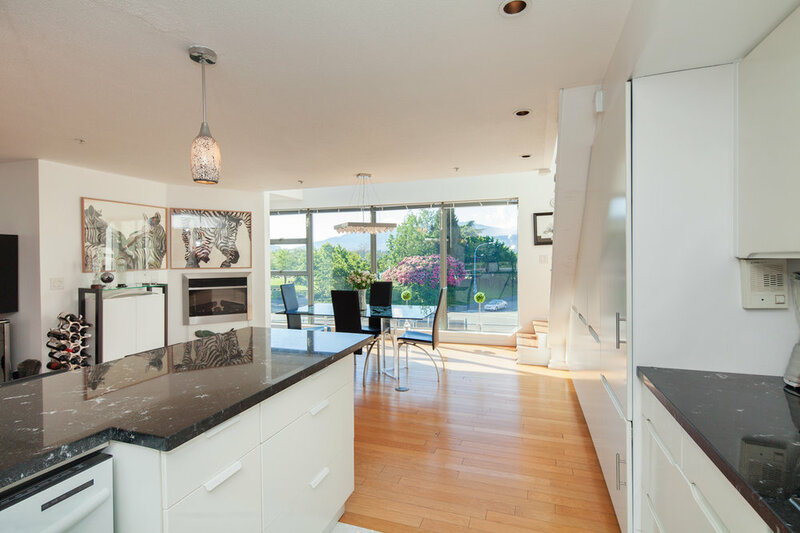 Commanding city, mountain, water & park views from this stunning, multi-level, Paul Merrick designed city home. "The proposal has been developed in response to the specific requirements of six identified purchasers, each seeking a unique sense of individual house within an urban context; in effect, they collectively wish to set a precedent for successful and highly livable inner city housing. Six townhomes have therefore been developed, each having an unfinished basement and three floors plus mezzanine, accommodating, in ascending order, a private garage and entry, sleeping accommodations, main living areas, and a multi-purpose mezzanine and outdoor roof terrace. The ground floor is designed to maximize the value or the space, providing a secure transition from vehicle to apartment, yet still providing a front door for visitors to the individual residents. The private garages are large enough to accommodate bicycles and one vehicle and , in three units, arc penetrated by light from North facing windows along the property line. Main living areas are located on the third level to achieve maximum North facing views and sunlight penetration above the rail yards immediately adjacent. Each unit is also provided with an outdoor balcony overlooking the street at this level.